This caught my attention, since the flight usually goes from London up over southern Scotland and fairly close to Iceland, before coming in over Newfoundland, and through Canada into Chicago. We were obviously following a considerable detour. Irish airports have been closed again for the fourth day this week, as the volcano transitions from just flowing lava into explosive eruptions again. 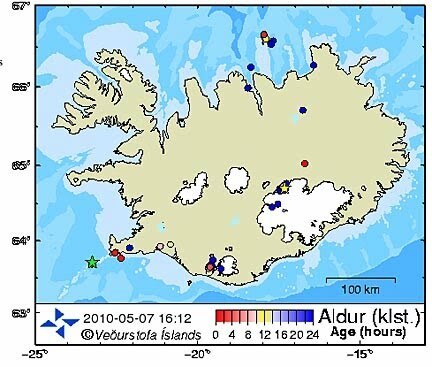 Late Thursday, Icelandic meteorologists and geophysicists warned Eyjafjoell would emit a larger ash cloud after renewed activity, though Oddson said it had stabilised overnight. "Right now, we're not seeing nearly as much ash fall as in the first few days of the eruption", which paralysed European flight traffic for a week from April 14, he said. The ash, at sufficient concentrations, poses a hazard for plane engines. The problem is large enough that is has spread down to affect flights out of Portugal. 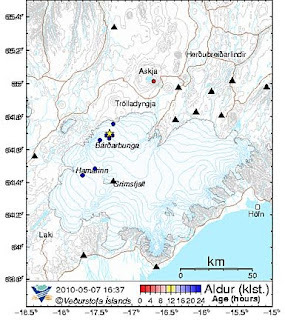 The first is the increase in the earthquake activity at Eyafjyallajokull and the spread to Myrdalsjokull (under which sits Katla). The second is the increasing activity up around Loki. Note that the stars are for earthquakes above a level 3. Interesting that this is at a depth of around 1.1 km, while the last over 3 one there was at a depth of 3.3 km. 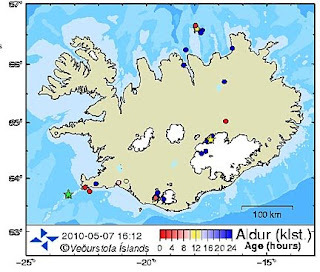 There is still not much activity in the area of Laki – which may or may not be a good sign. But since we are dealing with geological events here, with the difference in scale that they have, even an instant response can be measured in months and years, rather than hours.